Purchase a copy from Amazon. Keary Taylor grew up along the foothills of the Rocky Mountains where she started creating imaginary worlds and daring characters who always fell in love. She now splits her time between a tiny island in the Pacific Northwest and Utah, with her husband and their two children. She continues to have an overactive imagination that frequently keeps her up at night. House of Kings is the third book in Taylor’s House of Royals series. Let me stress this is more than a trilogy. 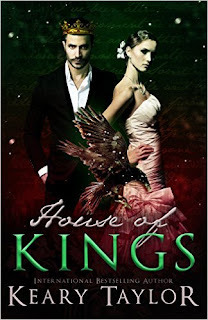 It is not apparent how many books are anticipated for this series, but Taylor has acknowledged that two more books will follow House of Kings within the year. And, it will take at least two more books to complete this story, judging by where House of Kings leaves us hanging. Alivia is officially dead or undead. The story begins with her waking up as a vampire and rightful ruler of the Southern Mississippi vampire coven, a role she inherited from her father’s royal bloodline. Alivia battles accepting who she now is and fighting to remain who she once was, while playing careful politics with a mad king. There is no room for error, and enemies are waiting to trip her around every corner. Adhere to these two warnings: Read the series in order, and be prepared for feelings of frustration after this third one. Just when you think the end is insight and answers will be revealed, Taylor pulls the rug from under you, and you will have many more questions. However, it’s the anxiety of the storyline and your anticipation for the next installment that will have you hooked on this series! I have a feeling the next two books will have much to reveal. So, for now, I rate this one 3.75 stars.